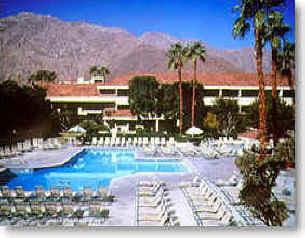 http://www.hiltonpalmsprings.com/ for discount rates. Mention Futurehealth to get the $143 conference rate. The rate expires soon. Call right away. Plus, get a $20 per night room rebate* from Futurehealth for each room night at the hotel. Cost per night is $123, after rebate credit*, an amazing price for an excellent hotel in Winter in Palm Springs, where rates can easily exceed $200. Price includes free tennis, hot tubs open past midnight, parking. Rooms for the Conference hotel, the Hilton Palm Springs Resort are Still available Call 760-320-6868 to make your reservation. Refer to the "Futurehealth meeting" to get the conference rate. If you get "bounced to the national Hilton reservation system, they may tell you no rooms are left in our room block. It's bad information. Make sure you call the actual hotel at the number above. They'll get your rooms. To book your room over the internet, go to http://www.hiltonpalmsprings.com/, select groups, then futurehealth, then enter the username winterbrain, then the password brain to access the conference rates. Click to see More Palm Springs scenery, sure to entice you. $20 Hotel Rebate Credit for each night a person stays at the meeting hotel. This offer is restricted to registrants who pay the normal registration fee for a given date (not available to discounted registrations. The credit is based on $20 per night per room, so, if two people stay in a room, the credit is a total of $20 or $10 per person. The registration fee as listed in above schedule, and registrants must register in the hotel as a Futurehealth meeting attendee, not under any other arrangement. The discount is not available to exhibitors or people who register on a work-study basis. We offer this for each night you are attending the Futurehealth meeting or pre or post conference events you have registered for through Futurehealth to a maximum of 5 nights .To get the rebate credit you must provide us with a copy of your paid hotel receipt, after you've checked out. The credit can be applied to anything Futurehealth sells or to early registration for the next year's meeting. It can not be applied to purchases at the meeting you get the credit for, except to pre-register for the next year's meeting or workshops. Why do we do this hotel arrangement? 1) This meeting is more than just the imparting of information. It is the creation of a very very special community, which repeat attendees have grown to cherish and look forward to reconnecting with each year. We want you to stay at the hotel to be a part of it. 2) Because, in order to get a hotel with decent conference facilities, we need to commit to have a minimum number of rooms picked up by registrants.